Build a Linux Game Console with Steam Big Picture Mode? Valve has introduced a new feature recently called Big Picture Mode, that will allow you to use Steam with your TV and game controller. You will be able to enjoy your Steam games from the comfort of your couch. 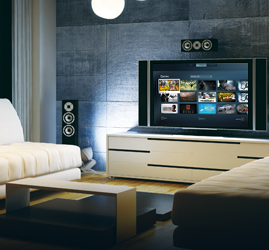 Big Picture Mode has an optimized user interface, suitable for browsing games and apps on TV screens. It also features a new innovative web browser that lets you browse the Internet with a first person view. Valve is looking to release Steam Linux Beta next month. Now the cool part is, Steam will fully support Big Picture Mode on Linux. Steam on Linux will fully support Big Picture mode and it should be available right around the full public release. Linux based HTPCs using open source tools like XBMC are quite popular. Once Steam and Big Picture Mode is released for Linux, setting up your own console in living room will be quite easy. Specially with a setting that allows you to directly boot into Steam Big Picture as soon as you turn on your PC. Big Picture Mode full Linux support can also be one more step towards rumored Steam Box console by Valve.